Spookley the Square Pumpkin: In a world where "the only good pumpkins are round pumpkins," Spookley the Square Pumpkin is often teased by the other pumpkins because of his square shape. Soon, Spookley is befriended by Edgar, Allan and Poe, three hilarious spiders, who convince Spookley that, square or not, he has a right to be the "Pick of the Patch" on Halloween. A square pumpkin the "Pick of the Patch"? Not if mean round pumpkins Big Tom and Little Tom can help it. These two bullies tease and taunt Spookley because of his square roots. Although he is encouraged to continue to become the "Pick of the Patch" by kindly Jack Scarecrow and his bat sidekicks, Boris and Bella, Spookley isn't sure he has what it takes until a mighty storm threatens to destroy the entire patch. As the storm rolls the round pumpkins across the patch towards a raging river below, Spookley's square shape helps him save the day. Spookley realizes "it's fine to be round while the weather is fair, but there are times it's better to be a square!" 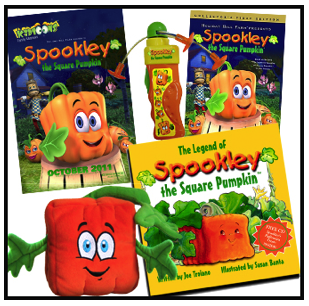 October is National Bullying Prevention Month and Spookley the Square Pumpkin has been named the offical Spokes-Pumpkin through a partnership with PACER Center. Go here for more information. Kidtoons is "dedicated to helping parents connect with their kids by bringing family friendly animated movies to the big screen." Find a location near you here. There have been lots of new theaters added this month! 1. Like Tight Wad in Utah on Facebook. -Leave a comment on this post stating your closest Kidtoons location. -Leave a comment on Kidtoon's Facebook Page that Tight Wad in Utah sent you. Giveaway will end Monday October 31st at midnight MST. Winner will be chosen by Random.org. No compensation was received. Prize packs sponsored by Kidtoons. Email addresses will be deleted after giveaway. Your privacy is important. US residents only. The closest location to me would be in West Palm Beach, FL. The closet location is in West Valley City which is 2 hours away :)! The closest location for me is Kennewick, Washington - Carmike Cinemas. My closest location is the Kennewick Carmike 12 Cinema. My closet Kidtoons location is our Carmike CInemas in Maryville, TN. our closest is also West Valley City! thanks for the giveaway! The closest location to me is Jackson, Davis Planetarium! My closest one is West Valley City. My closest is in West Valley City. Love love love Spookley the Square Pumpkin. My little tots love Spookley too. So I follow Kidtoons on Twitter and FB, I like Tight Wad in Utah on FB, and the Allentown Carmike is the closest theater. Tweeted giveaway twice too! I'm in SW Michigan close to IN; the closet theatre is in Elkhart IN. There's NO Kidtoons site in my entire state (AR) OR LA (which I'm close to... guess the closest location would be Oklahoma City OK!!! My closest location is West Valley City, UT. My closest location is in West Valley City...which is where I live so it's very close! San Antonio, Santikos Rialto Piccolo 9 is the nearest location. Closest location is MCKinley Mall in Buffalo NY. My closest location is Kennewick WA. The closest to me is in Allentown, PA Carmike 16. The closest Kidtoons is Columbus, OH. kristiedonelson(at)gmail(dot)com Thank you. Lakewood about 20 mins from us! My closest Kidtoons location is Rave Motion Pictures in Las Vegas, Nevada.